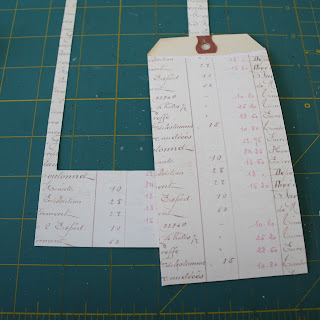 I was cleaning up my work table this morning which was covered with stuff from the tags we've been doing here on the blog for the past two weeks. As I was gathering stuff up I was thinking, "What in the heck am I going to do with all these tags?" (you know, I am trying to get over my hording saving issues). So I decided to give them away, along with the 3 three clear stamps I used to make them (from my own stash), a brand new bottle of Halo glitter (my favorite), miscellaneous chipboard pieces you might need to finish the calendar, the Tim Holtz mask we used, and a sweet little bird. Some of the tags come with the fixings but some are plain, like the window (you will have to find your own silver ladle to put the little bird in). If you would like to win the tag package just make a comment on this post between now and Sat at midnight. We will choose a winner at random on Sunday, Jan 3rd. Stamp tag with the script stamp we have been using throughout the project. I used Distress ink - Antique Linen (Ranger). Stamp tag with a large flourish. I am using one from the 7gypsies Calais stamp set. 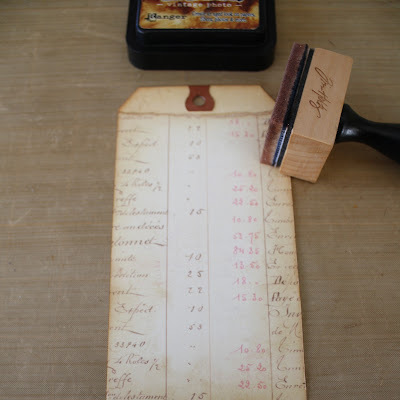 This time I changed ink colors to Frayed Burlap (if you want to stick with Vintage Photo that is fine too). Stamp the tag twice, turning the stamp so the end of the flourish is in the center of the tag. Ink the edges of the tag with Vintage Photo to age it. Add a bit of 7gypsies paper tape to the edge. Super easy to use, just rip and stick. I added a bit of ink over the top. Now set tag aside. I am using a vintage leaf, one of the darker inks and the large flourish stamp for this next embellishment. The leaf has a wire in the back to maintain it's shape. Stamp the leaf with the large flourish stamp. Follow the pattern of the stamp with Glossy Accents. I was going for the look of brocade fabric here but you can use a little or as much Glossy Accents as you like. Just remember, the thicker you put it on, the longer it takes to dry. Pour glitter (Stampendous Ultra fine Halo glitter - gold) over the leaf. Let a dry a few minutes and then tap off. If there is any residual glitter, I like to brush off with a small paint brush. Stamp the bottom of the tag with a stamp from the Venice stamp set. On the left is the original rubbing...the right has the new stamp. 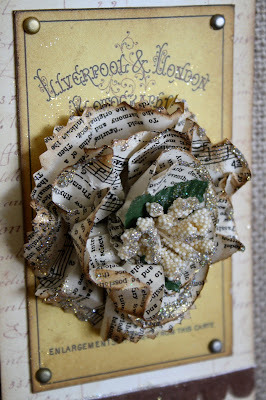 Cut the back off an old earring with a pair of the Tim Holtz scissors (Tonic)...I love these scissors! They will cut through almost anything. If you don't have a pair, you should. Add a bit of Glossy Accents to the back of the earring and stick to the leaf. Hold it in place at least a minute or two to secure to leaf. Add a few pieces of chain and a jump ring to a large key. Gather tag, leaf, and key and secure to calendar with pin. So lets do another tag using the same stamp but in a different way. Adhere vintage music paper to tag. 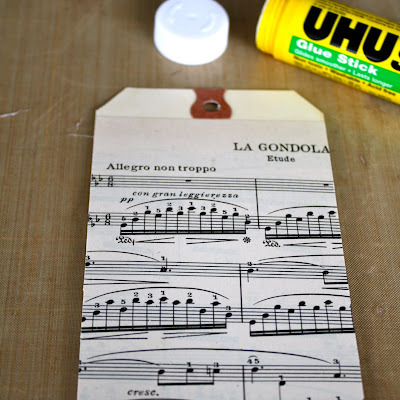 I like UHU glue stick for this. It can be challenging to use a tape runner with vintage paper because sometimes it will peel up a layer of the paper as you are rolling the tape on. Now I just stick (no pun intended) to UHU. Use the same large flourish as in the last tag. I used a StazON ink -Timber brown for a darker edge. This time we are going to use the stamp to create an all-over pattern. Stamp the tag 3 times, working your way to the top of the tag. I had to turn the flourish stamp each time I stamped so the pattern would fit. 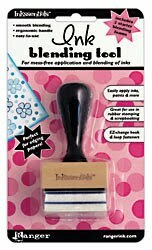 This is what mine looked like when I was done stamping. 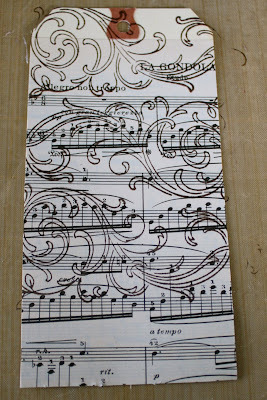 Then I used a silver metallic Sharpie marker to fill in the empty space of the flourish. It takes a few minutes to do this but it's well worth it. I love the look the metallic marker give the vintage tag. Here's what it looks like when it's all filled in. Leave some brown showing for definition. Same stamp, totally different look than the last one with the glitter. Ink the edges with Vintage Photo. I just love this technique...it unifies all 24 tags on the board by giving them the same color edge. NOTE: I have mentioned this before but if you are using a BRAND NEW Vintage Photo ink pad it is very dark. And because it is so dark you will probably want to stamp on a paper towel before inking the tag. My stamp pad has been used A LOT so it's easier to get a more subtle color. Ranger makes a such huge range of Distress ink (with 12 new one's coming at CHA in Jan) that you might need to experiment with what works best for you. To finish the tag I added a large C and a vintage mother of pearl shoe clip that I found on my last trip to Paper & Metal Scrappers in Payson, AZ. The font for "is for Christmas" is Jailbird Jenna, same as Merry Christmas on number 25. Well, we have one more tag to go before we move on to something new (right now I wish I knew what that was going to be). In a couple days I will be back with Tag #3, the dreaded paper flower. I saved that one until last because it took me that long to figure out how I did it. But once again, the thought came to me while I was in the shower last Tuesday so...the mystery is solved!